Postmaster DL Envelope 114x235mm Window Gummed 90gsm White (Pack of 500) B29153 Pack of 1 Postmaster White Gummed Window Envelopes 90gsm. Specially designed envelopes for use in all known mailing machines. Slightly larger than conventional envelopes to allow easy insertion of contents. 114x235. 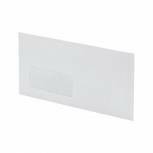 Postmaster DL Envelope 114x235mm Window Gummed 80gsm Manilla (Pack of 500) D29152 Pack of 1 Postmaster Manilla Gummed Window Envelopes 80gsm. Specially designed envelopes for use in all known mailing machines. Slightly larger than conventional envelopes to allow easy insertion of contents. 114x235. 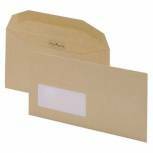 Postmaster DL Envelope 114x235mm Gummed 90gsm White (Pack of 500) F29151 Pack of 1 Postmaster white gummed envelopes 90gsm. Specially designed envelopes for use in all known mailing machines. Slightly larger than conventional envelopes to allow easy insertion of contents. 114x235mm. 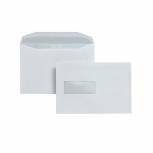 Postmaster Envelope 162x238mm High Window Gummed 90gsm White (Pack of 500) A29984 Pack of 1 Postmaster High White Window Gummed Envelopes 90gsm. Specially designed envelopes for use in all known mailing machines. Slightly larger than conventional envelopes to allow easy insertion of contents. C5 - 162x238mm.